I have always fancied purple eyeshadows and liners. I think purple compliments my brown eyes beautifully, and the color just does something magical to my eyes. They become more pronounced, defined, and even a little mysterious. 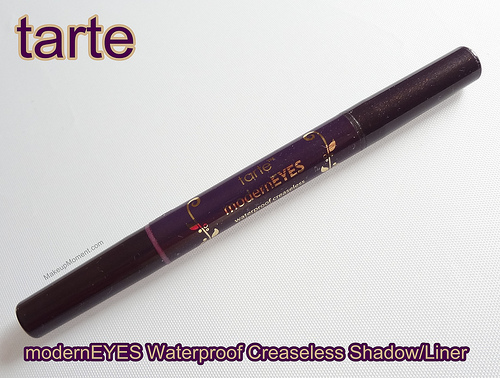 When I saw that Tarte's modernEYES Waterproof Creaseless Shadow/Liner Duo in Plumberry/Plum Brown was part of the QVC exclusive six piece high performance collection, I was very excited to try it out. The plum tones are right on trend for the coming fall months, which is when I like to incorporate a little bit of purple into my look. 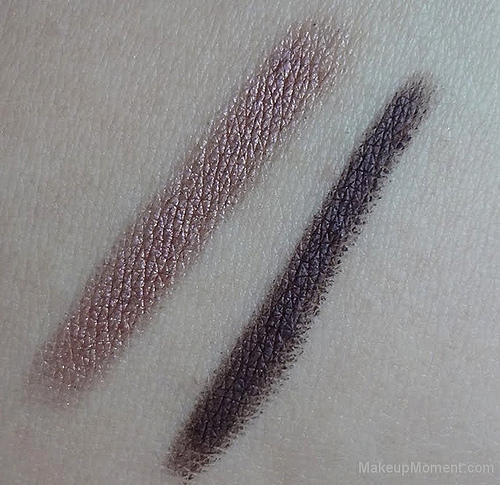 This double-ended duo contains a pinkish purple champagne eyeshadow on one side, and a deep plum/brown eyeliner on the other. Both products contain very fine golden shimmers, which accompany the purple tones beautifully-especially the eyeshadow. The shadow transmits a gorgeous golden pink duo-chrome, that when worn on the lids, gives the base color an extra special kick. The packaging definitely gets points for it's convenient nature. Not only does it have a handy retractable mechanism but, this is also a great product to bring along when traveling because it contains both your shadow and liner, all in one place. Love! When I applied both the shadow and the liner, they didn't go on so smooth at first. But once my skin warmed up the product a bit, their creamy texture peeked through and they glided on like butter. The shadow blends amazingly well, with very little effort at all. And I obtain a rich color payoff from the liner with just one swipe. 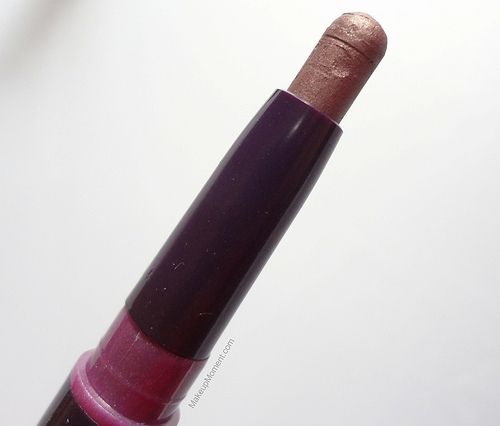 So when it comes to pigmentation, these leave nothing to be desired. I do suggest working fast with these as they both dry and set pretty quickly-almost instantly. Once these are on, they won't budge. I have super oily lids so eye primer for me is an absolute must. I don't dare try these over my bare, oily lids because I just know that these will slide off in no time. Atop primer, the shadow and eyeliner hold on exceptionally well for the day. I experienced no creasing from the shadow or liner, but the colors did fade after a few hours. Very minimally, though. The eyeliner lasted about 3-4 hours on my waterline with very little fading, which I think is pretty impressive. I was watching a TV show while I had these on and I happened to tear up a bit during certain emotional scenes...I am a tad sentimental sometimes, what can I say? In any case, as for the waterproof claim, I deem it to be effective for the shadow, but not so much for the liner. The shadow stayed in tact, but the liner did smudge while a few tears streamed down my face. 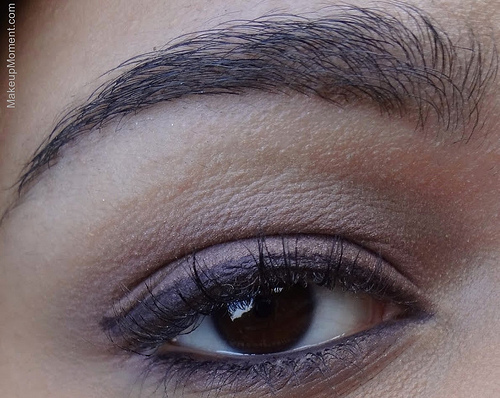 Here is a look that I created showcasing how I used the moderEYES shadow and liner duo. I applied the shadow all over my lid area, then quickly blended it out with my finger. While blending, I took the color above the crease just a bit. Next, I lined my top lash line with the liner, and created a tiny flick of a wing. I then applied the liner on my lower waterline, and smudged a bit of the shadow on my lower lash line. Finally, to complete the look, I coated my top and bottom lashes with Tarte's Gifted Amazonian Clay Smart Mascara. This look was super easy to create-took literally minutes! And I really loved the results that I obtained. Super pretty! 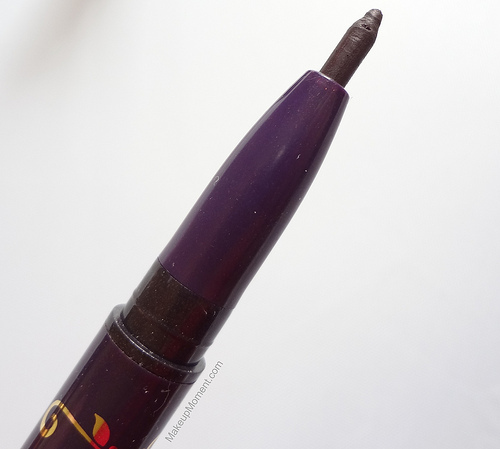 Overall: Thanks to this duo, sultry purple done-up eyes can easily be achieved in minutes-no tools required! I am pretty content with these two products. The purple plum tones along with the golden hints, compliment each other beautifully, and it adds that little something extra that makes these two so perfect together. I find that the shadow and liner can easily be sported day or night. That's the beauty of purple-it's not too harsh of a color that it must only be reserved for night. It can definitely peek out in the daytime, too, without looking overdone. I think I just found my new autumn staples. 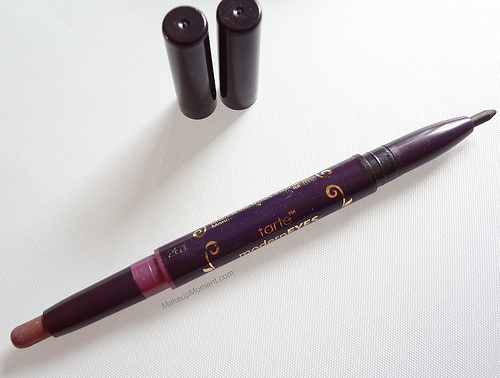 What do you all think of Tarte's moderEYES Waterproof Creaseless Shadow/Liner Duo in Plumberry/Plum Brown? Very pretty look and color combo.